The space between electrodes in Dye Solar Cells is filled with an electrolyte. Our Iodolyte products are a range of ready-to-use electrolytes for this application. Their composition is based on the iodide/tri-iodide redox couple, which has been proven to perform the best in Dye Solar Cells. The composition of all Iodolyte electrolytes were carefully developed with state-of-the-art additives to ensure excellent Dye Solar Cell performance and durability. What's more, the Iodolyte products are fully compatible with our Meltonix sealing films. These hot melt films provide a discrete confinement of the electrolyte between glass electrodes. Ready to experiment with your own formulations? 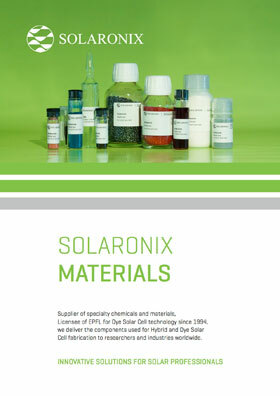 Have a look at our solar-grade ionic liquids. They may be used either as additives, or as solvent replacement in your electrolytes. All of our Iodolyte products are available in bulk quantities for industrial purpose. Inquiries are welcome. A 30 mM iodide/tri-iodide electrolyte formulated using a low viscosity solvent for maximum performance. It is typically employed for high performance Dye Solar Cells, and for establishing reference samples when studying new compounds. Additives: ionic liquid, lithium salt, pyridine derivative, thiocyanate. Iodolyte AN-50 is the lowest viscosity electrolyte formulation for high performance in Dye Solar Cells. This classic formulation with acetonitrile has been long used for benchmarking efficiency in Dye Solar Cell research. Additives: ionic liquid, lithium salt, pyridine derivative. Prepared in propionitile, Iodolyte PN-50 is a higher boiling-point formulation, yet high performance, electrolyte based on the iodide/tri-iodide redox couple (50 mM). A 50 mM iodide/tri-iodide electrolyte formulated with a higher boiling point solvent which makes it suitable for long term stability assessments. Additives: ionic liquid, alkylbenzimidazole, thiocyanate. A 100 mM iodide/tri-iodide electrolyte formulated with a higher boiling point solvent which makes it suitable for long term stability assessments. A 150 mM iodide/tri-iodide electrolyte formulated with a higher boiling point solvent which makes it suitable for long term stability assessments.